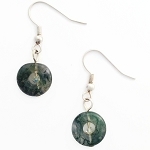 Agate represents Balance, Harmonizing, and Longevity, and is a birthstone for the month of May. 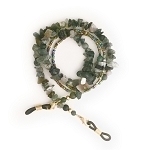 This lanyard is beaded with mixed earth, green, and aqua glass beads with accent sections of agate beads and nuggets. The ends are finished with a reinforcing guards for strength and durability, and lobster clasps for interchangeable or replaceable ID holder. The metal parts are goldplated. 32 inches in length, this one slips right over your head and has a sturdy, beautiful giant swivel clasp to hold your nametag, key, or whatever you like to attach to a lanyard. Just because you have to wear an ID badge doesn't mean it has to be drab - so here's another fun lanyard! ...Beaded ID Lanyards of beauty and quality - we lovingly handcraft them with glass, Semiprecious Gemstone, and Crystal beads - an excellent choice for anyone who must wear an ID badge, such as government, school, health care workers, and others. We make ID lanyards that slip over your head, or with magnetic breakaway clasps, in designs from simple beaded strands, to accent sections of crystals or gemstone nuggets, to charm or bead-link connectors, and whimsical motifs. and more - let us know of other things you use yours for! Thank you so much for looking - be sure to let us know if you have any questions - and please consider joining our VIP Email list with the link at the bottom of the page.